Instant noodles are a staple for people are on the go as well as those who don’t want to spend a lot of money on food. They’re fast, inexpensive, and filling. Even vegans and vegetarians eat instant noodles that are fit for their taste. While not everyone can say that they are healthy, they are considered not in the same league as burger, fries, and other greasy foods. You would probably pick instant noodles over a fast food burrito because you think they are healthier. Even after two hours of consuming ramen noodles, they are still undigested. This puts a huge problem on your digestive system because it is forced to do its job for a prolonged time just to break down the noodles. In contrast to other processed foods, they are not processed as quickly as they should, since most processed foods don’t have fiber. When there is no fiber, breaking them down is a lot quicker, which results to interference with insulin production and blood sugar levels. Since the noodles are remarkably intact, they will stay in the digestive tract until they are digested. This has a negative on your body’s ability to absorb nutrients. What’s even more disturbing is that the noodles are not nutrition-rich in the first place. Instead, there are additives in them, including tertiary-butyl hydroquinone (TBHQ), a toxic preservative. As the noodles stay in your digestive tract, TBHQ remains with them as well. There is still no study that shows what could happen to your body and your health when the additive remains in your stomach for an extended period of time. Nevertheless, as it is toxic, you probably already know it will not give you any health benefits. Tertiary-Butyl Hydroquinone is considered an antioxidant because it prevents fat and oil oxidation. In this case, if it is added to a processed food, such as ramen or any kind of instant noodles, they will have a much longer shelf life. While TBHQ is an antioxidant, it should not fool you into believing it is the good type. It is not natural since it is a petroleum industry byproduct – meaning it is merely a synthetic chemical that happens to have antioxidant properties. It is a common ingredient in food, but it also found in products used on non-food items, such as lacquer, vanish, and pesticide. Some perfumes and cosmetics use TBHQ to increase stability while decreasing evaporation times. Safety of consuming foods that contain TBHQ remains controversial. The Joint FAO/WHO Expert Committee on Food Additives held the 19th and 21st meetings where the experts discussed TBHQ. It was determined that people can consume up to 0.5 mg/kg of TBHQ depending on the body weight. Meanwhile, the Codex commission said that you can consume TBHQ as much as 400 mg/kg this time based on the food where it can be found. Currently, chewing gums contain the highest TBHQ levels and are still deemed safe. The US Food and Drug Administration states that processed foods should not contain more than 0.02% of TBHQ based on the fat and oil content of the product. If you are a woman and you normally consume instant noodles, it is time to change this habit. According to the study posted in the Journal of Nutrition, women who eat a lot of instant noodles (more than twice per week) increase their risk of acquiring metabolic syndrome of up to 68%. Metabolic syndrome comes with a group of conditions, including central obesity, elevated fasting blood sugar, high blood pressure, increased fasting triglycerides, and decreased levels of HDL cholesterol. When you have at least three of these conditions, you could develop cardiovascular diseases or diabetes or both. The missing nutrients are replaced by excessive energy, but also come with sodium and unhealthy fats. 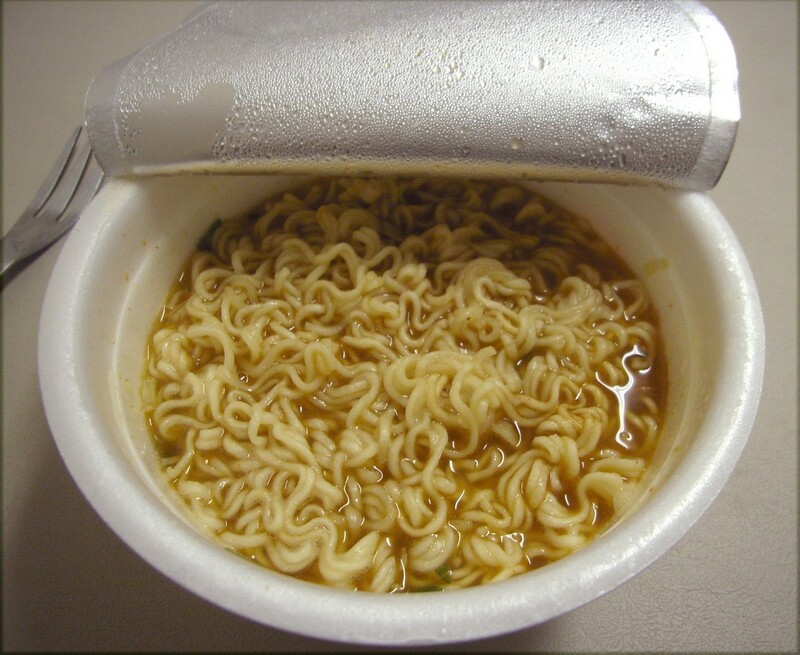 In fact, one pack of instant noodles could contain as much as 2,700 mg of sodium. There’s also TBHQ to be worried about though this and the other known ingredients are not just the ones present in a block of dried noodles. In June of 2012, the Food and Drug Administration of Korea discovered Benzopyrene, which can cause cancer, in several packs of noodles. Thankfully, the investigation led to the disappearance of the noodles with the dangerous substance. Still, there’s no way of telling that they have completely disappeared in the market today. Here’s another reason to avoid instant noodles: monosodium glutamate, an excitotoxin that has the ability to overexcite your nerve cells. When this happens, damaging effects take place and can even cause death due to brain dysfunction. MSG is one of the culprits behind learning disabilities, along with Parkinson’s disease, Alzheimer’s disease, and Lou Gehrig’s disease among others. MSG contains free glutamic acid (approximately 78% content), which is the exact same neurotransmitter used by many parts of the body to initiate important processes in the body. There have been several studies where MSG is used to increase the weight of mice, so you can assume that this is a drug that can cause obesity. If you are watching your weight, you surely don’t want to add MSG to your diet. While instant noodles does not make you healthy and also stays in your stomach for prolonged periods of time, this does not mean they can kill you when you eat a package. In truth, occasional eating is still safe and can still be your go-to meal when you don’t have enough time to prepare a full meal. However, if you truly want to be healthy, consume real, healthy foods. As much as possible, you should avoid processed foods, including instant noodles because they not only pose health hazards, but can also fatten you up even if you eat them twice a week. Processed foods contain high amounts of sugar, refined carbohydrates, fructose, and many artificial ingredients. They don’t have or have very little amount of fiber and nutrients. Plus, they are very addictive, encouraging you to eat more than you should, therefore causing food cravings. Eventually, unintentional weight gain happens. The negative effects do not end there as instant noodles and other processed foods promote your body’s resistance to insulin. They can also cause chronic inflammations, which can be signs that you have an underlying medical condition. It is not too late to switch to healthy foods. In fact, if you are in a hurry, instead of reaching for a package of instant ramen, you should just eat fruits and vegetables since they are very easy to prepare. Other healthy foods to consume include eggs, lean meats, and whole foods. Previous articleDoes Your Nutrition Bar Live Up to Its Hype?